Justin Rose retained his composure after littering his card with three big mistakes on day three, but he maintained his three-shot lead at Torrey Pines. 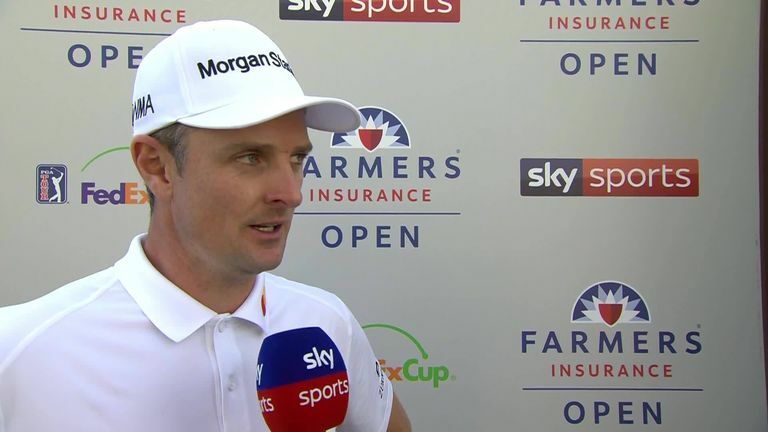 Justin Rose maintained his three-shot lead despite making two big errors down the stretch on the third day of the Farmers Insurance Open at Torrey Pines. Rose had six birdies and an eagle on his card and could have been out of sight to the chasing pack had it not been for a pair of double-bogeys as well as a bogey-six at the last which completed an entertaining, but erratic 69 for a 54-hole score of 18 under par. Aussie veteran Adam Scott enhanced his chances of a first win in almost three years with a best-of-the-day 65 as he emerged as Rose's closest challenger, while first-round leader and 2017 champion Jon Rahm goes into the final round four strokes off the pace. Rose had earlier appeared likely to turn the final day into a procession when he holed 15-foot putts for birdie on the first and third greens, but he gave both shots back at the fourth following a wild second from a fairway bunker that disappeared into a hazard. But he responded with a two-putt birdie at the long sixth, and pulled further away from the field when he rolled in a 20-footer from the rear fringe for eagle at the ninth to cap an outward 33. After nailing another mid-range birdie chance at 11, Rose came within an inch of another eagle at the 13th before suffering another setback at the next, pulling his second way left of the green and into the bushy unknown, leading to his second double-bogey of the day. Rose's sublime putting was rewarded with a further birdie at the 16th for his third two of the round, but he was unwise to go for the final green in two from the left rough as his ambitious three-wood failed to make the carry over the lake. The world No 1 dropped, pitched and two-putted for a closing six which offered a glimmer of hope to Scott, who made huge inroads into Rose's lead with a remarkable front-nine 30. Scott birdied the first and then holed a perfect 103-yard wedge for a thrilling eagle-two at the second, and he bounced back from a bogey at the fourth with four birdies over the next five holes to race to 14 under. The 38-year-old picked up another shot at the long 13th, although he looked a little red-faced at 16th when he shanked a bunker escape and did well to two-putt from over 50 feet for bogey. A nice four at the last secured outright second for the former Masters champion, while Rahm matched Scott's run of four birdies in five holes on the outward half before his sixth gain of the day at the last saw the Spaniard return a 68. Unheralded American's Doug Ghim and Talor Gooch both fired commendable 67s to reach 13 under and 12 under respectively, while Rory McIlroy ground out a 69 to get within seven of his Ryder Cup team-mate. 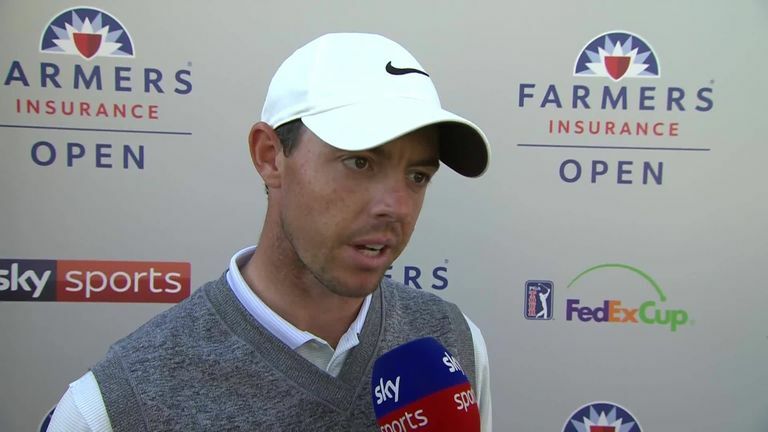 Rory McIlroy was not ruling out his chances of victory on his debut at Torrey Pines after a battling third-round 69 left him seven adrift of Justin Rose. McIlroy was again not at his free-flowing best, but he did manage five birdies against two bogeys and finished on a high note when, after chipping in to save an unlikely par on 17 following a penalty drop, he knocked a towering fairway-metal onto the green at the last and safely two-putted down the slope for a closing four. Tiger Woods, meanwhile, will be looking to end his first start of the year with "something positive" after another frustrating day, although he dug deep to return a 71 with three birdies over the last five holes which lifted him to five under for the tournament.